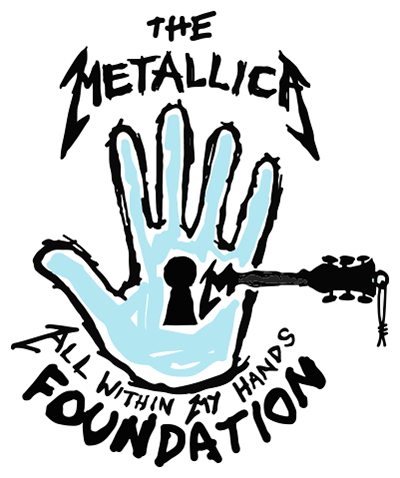 All Within My Hands held its inaugural benefit, The Helping Hands Concert & Auction, in November of 2018. Metallica headlined with a rare acoustic performance which is currently available for digital download. All net proceeds from the sale of the show will be donated directly to the Foundation. In 2017 Metallica participated in Ten Bands One Cause, releasing a special edition of Hardwired…to Self-Destruct on Pink Vinyl, proceeds from which benefited Gilda’s Club NYC. A Record Store Day 2016 exclusive, Metallica released Liberté, Egalité, Fraternité, Metallica!, a live recording of their performance at Le Bataclan in 2003. Profits from the sale of the CD went directly to the victims of the 2015 Parisian attacks, specifically those of Le Bataclan theatre, via Fondation de France’s Give For France. Proceeds from the sales of downloads and CDs of various concerts have been donated to numerous causes including 2015 Houston flood relief, the MusiCares MAP Fund, and the Bridge School.